Regular aerobic activity like power walking and jogging can help you live a longer and healthier life. Moving at a moderately brisk pace also increases the number of calories burned. The faster the pace of a power-walk or jog the more calories you'll burn in one hour. Other factors must also be considered when calculating calories burned. Weight and body size affect how many calories you'll burn from one hour of power walking or jogging. The more you weigh or the greater amount of muscle mass, the more calories you'll burn. Someone who weighs 160 pounds may burn 581 calories in an hour when jogging 5 mph, while a person weighing 240 pounds could burn 871 in the same amount of time. Walking at 3.5 mph might burn 276 calories per hour if you weigh 160 pounds or 345 calories if you weigh 200 pounds. Men generally use more calories than women during one hour of power walking or jogging because they tend to have more muscle and less body fat, which allows them burn more calories. Younger people burn calories faster than older adults because muscle mass declines as you get older while fat increases, causing a slowing of calories burned. Walking or jogging uphill or at an incline on the treadmill can increase calories burned in one hour. A treadmill burns the most calories of standard aerobic machines, notes University of Maryland Medical Center. Many treadmills allow you to increase your pace and adjust the intensity of inclines to further increase the number of calories burned per hour. Treadmills can also keep track of the calories burned. Burning roughly 300 to 600 calories per hour from power walking or jogging can help people maintain or lose weight and fight obesity. Women who regularly jog, take brisk walks or engage in other forms of aerobic exercise, and do not make any dietary changes lose substantially more weight than less active women. Burning calories from power walking or jogging may not only slim your hips and waistline it can help keep your blood pressure and cholesterol levels in check. People who walk or jog 12 miles a week may lower their LDL or "bad" cholesterol levels, reports University of Maryland Medical Center. 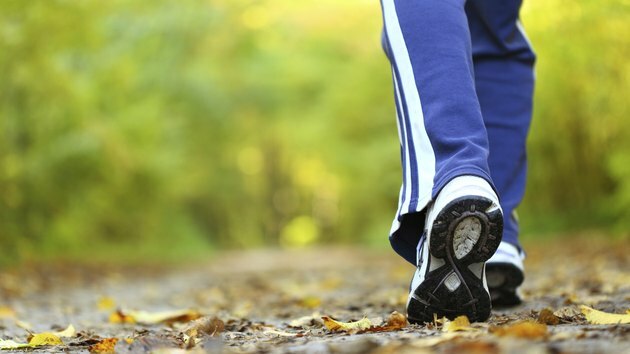 Jogging at least 20 miles a week is needed to boost high-density lipoprotein, or HDL, the "good" cholesterol. Jogging about 14 miles a week can help manage high blood pressure and possibly eliminate the need for blood pressure-lowering medications.